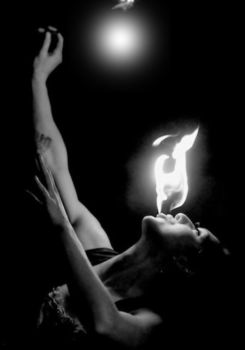 Jenny is an Aerialist, Acrobalancer, Fire performer, Circus entertainer, Burlesque dancer and Freak. She has been performing in Seattle and around the globe since 2004. For the past eight years she has been instructing partner balancing and aerial arts in Seattle; a certified yoga instructor, and fire arts coach as well. Her talents have been featured at venues such as The Gorge, WaMu Theater, Electric Daisy Carnival (Vegas, Delhi) and many local venues large and small.